KYLE, S.D. -- Russell Means, warrior for the people, was honored Wednesday night on Pine Ridge by his family, leaders of the American Indian Movement, friends and spiritual leaders at Little Wound School in Kyle, S.D. Horseback riders arrived with the ashes of Russell, who passed to the Spirit World with the Morning Star on Monday. Russell's brother Bill Means said, "He will be replaced by thousands. One person is not going to replace him, but through his work, through his family, he will be replaced 1,000 times over." 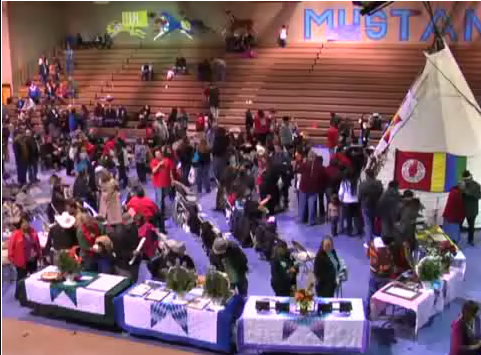 From the livestream, viewers around the world watched as Russell was remembered. Speaking on the birth of the American Indian Movement, Clyde Bellecourt described how he read Black Elk Speaks over and over in prison. Clyde said he began dreaming of those images and this gave birth to the American Indian Movement while he was in prison. Bellecourt said Russell's spirit is alive and he could see it in the spirit of the young people present, and in Russell’s children. “The Movement is inside of you, inside of each one of you, burning in your heart," Clyde said. Speakers remembered Russell from the Trail of Broken Treaties and the Occupation of Wounded Knee. Lakotas shared how Chief Frank Fools Crow had designated Russell as a spiritual leader. 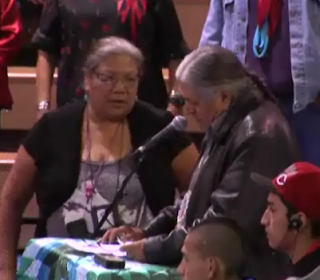 During the memorial, Dennis Banks spoke of the legacy of Russell Means and said he was with Russell when he passed. Banks said he brought Anishinabe wild rice to share during the dinner. Larry Anderson, Dine’ from Fort Defiance, Ariz., said Means taught the children about the traditional way of life and how to be a leader. “I met Russell Means during the Wounded Knee takeover, just down the road.” Anderson said he was one of five Navajos present during the takeover of Wounded Knee. Anderson said after he received his education, he heard about Wounded Knee. Anderson said he was sorry that he was unable to be here after Ted Means passed. Anderson said they drove 15 hours, from the Navajo Nation, for Russell's memorial. “It was a wonderful feeling to see old faces, and new faces.” Anderson said he is now a teacher. “It is fun working with children." Anderson then spoke to Russell Means in the Dine’ language, beginning with a greeting and gratitude. 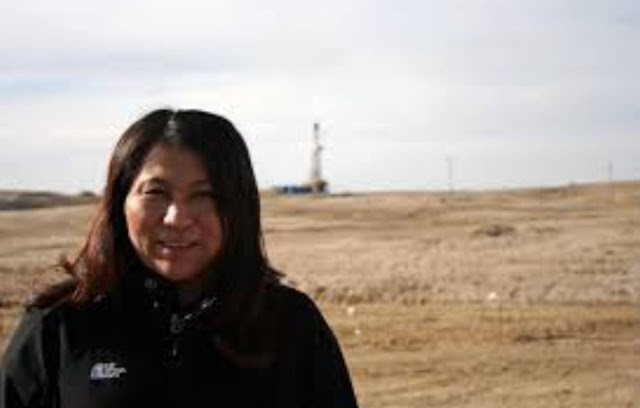 During the evening presentations, Madonna Thunder Hawk described the takeover of Wounded Knee and the firefights. “We were in the medic building, listening to it on the walkie talkie.” She said there was a call for medics as one firefight was going on, as one person had been hit. They tried to negotiate a cease fire, but it wasn’t possible. As she was rushing up the hill, she looked and saw one man running behind the medics with a stretcher, and it was Larry Anderson. At the memorial, Cheyenne Arapahoe arrived from Oklahoma and spoke of Russell Means and how he gave them strength to maintain their language and culture, in times of the southern battle against rednecks and racism. 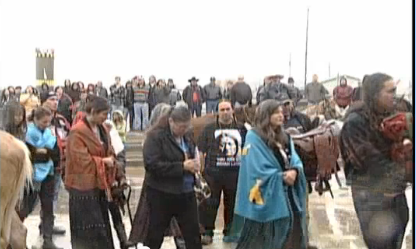 “It is really hard to be an Indian, especially a woman,” said a Cheyenne Araphoe women offering a tribute to Russell. “But when we get together, we stand strong.” She brought photos and video from Russell in Central America to share with the family. “Russell Means never left his people behind,” said one of the Lakota elders. The elder described how the rain had washed away Russell's footprints and what this means. He also said that Russell created the Yellow Thunder Camp in the Black Hills and upheld the Lakota Treaty, he said. The sound of the drum and the AIM song honored Russell Means who was a backbone of the Indian rights movement, and became a symbol of resistance to colonization, repression and injustice. I miss you Uncle...especially during times of crisis, you're words of strength are missed.